Take 1-2 tablespoons per day. Mix the measured amount of the powder in a glass of water and drink. 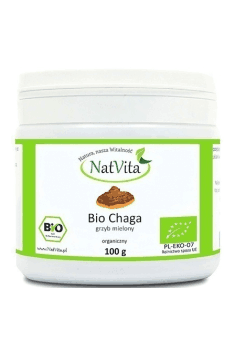 Although Chaga mushroom is not edible it is considered to be safe for the body. It helps especially in periods of reduced immunity and in the flu and colds season. The powder can be mixed with water or added to your favourite cocktail or salad. Diabetics taking standard blood-sugar-lowering medicines should be careful in supplementing as hypoglycaemic properties of Chaga mushrooms may cause hypoglycaemia.